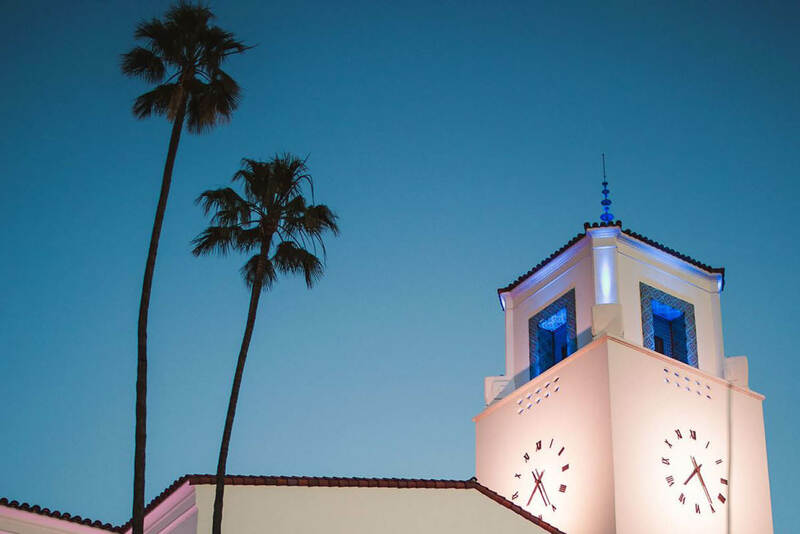 Union Station, LA’s railway hub since 1939, is an adjective magnet: it’s gorgeous, funky, and filmic. 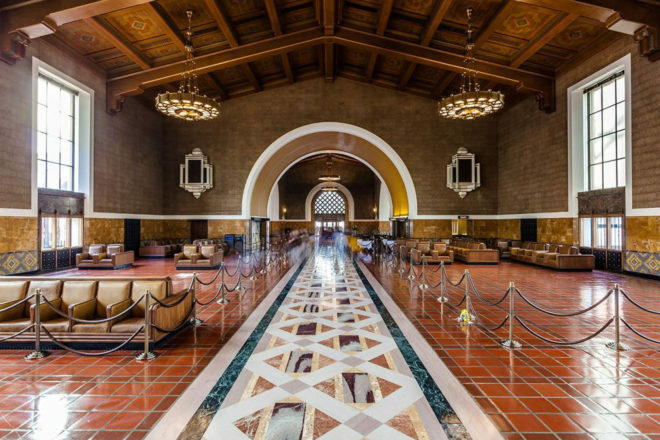 Enter Union Station, largest railroad passenger terminal in western United States. Union station is covered in beautiful 1939's art and architecture. Off to the trains, off on an adventure. Conversation and laughter echo around and around perhaps the grandest waiting room in the entire United States. 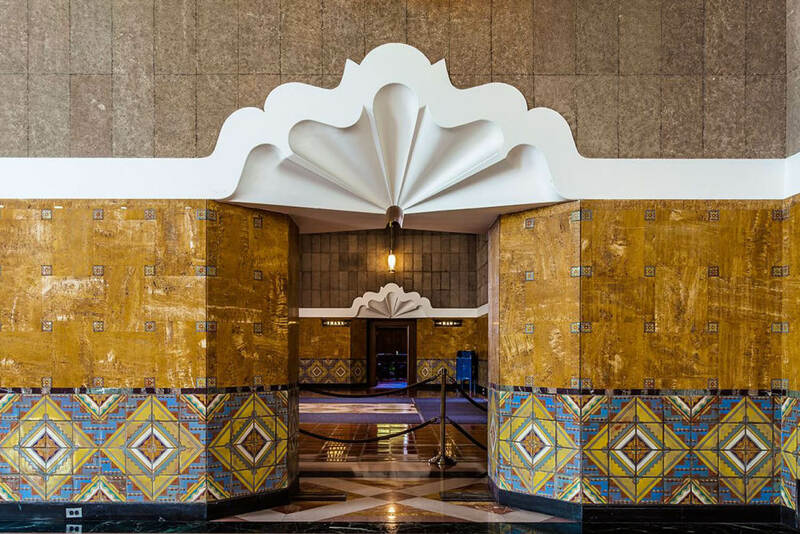 1930s architectural details in LA's Union. 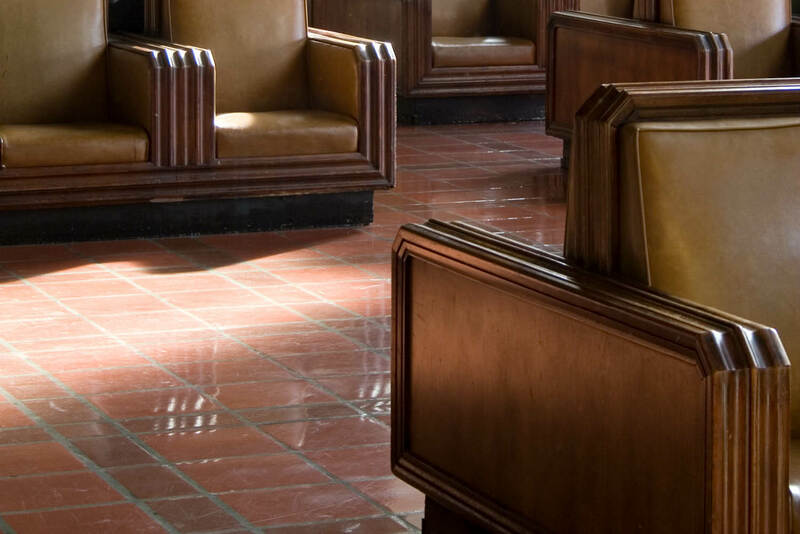 While you wait for your train, you can sit down and relaxed on the iconic chairs. Beautiful afternoon sky with Union Station clock tower. 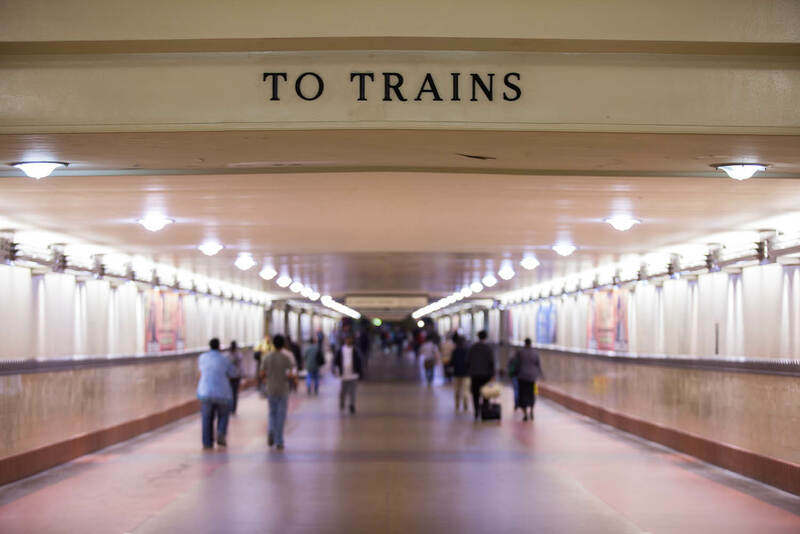 Sitting in the waiting room of LA’s famous railway station, we ponder: has America’s golden age of train travel been Trumped? The cacophony of the fight echoes around and around perhaps the grandest waiting room in the entire United States. The African-American man sitting to my left is in a seriously heated verbal stoush with a young Hispanic woman security guard. Like a bass drum, his voice reverberates off the hand-painted tiles and 12-metre-high brass-adorned windows. For not the first time, she orders him to exit the mustard-coloured leather chair that he’s been sitting on for the past hour while he “waits for his train”. These deeply recessed chairs, with high wooden armrests, define a 1930s style of comfortable, before pseudo sciences like ergonomics intervened. The willing cushions have been pre-softened by thousands of bums before yours over the years. There’s plenty of free chairs to sit on today, but as a sign says, this randomly cordoned-off part of Union Station is reserved for long-distance Amtrak passengers only. Even they only get to park themselves here two hours before their journey, she reminds him. “This woman’s a racist,” he tells me and then asks me where I’m headed without a change of tone. I can’t see the name of the place he tells me on the way-cool departure board we sit under. It’s probably a fair guess that he’s homeless. The security guard tells him to scram again. He ignores her again. Their eyes don’t meet at all. Instead they recruit me as a mediator. I play dumb(er) and take no sides. “Yeah, he was waiting for the same ‘train’ yesterday, too,” she says irately. And on it goes. Meanwhile, a shouty guy with distracted eyes shoves a young woman (perhaps an ex/partner) who almost drops the toddler she cradles. The platoon of security guards in earshot choose not to see this one. The rest of the waiting room cranes their necks expectantly. 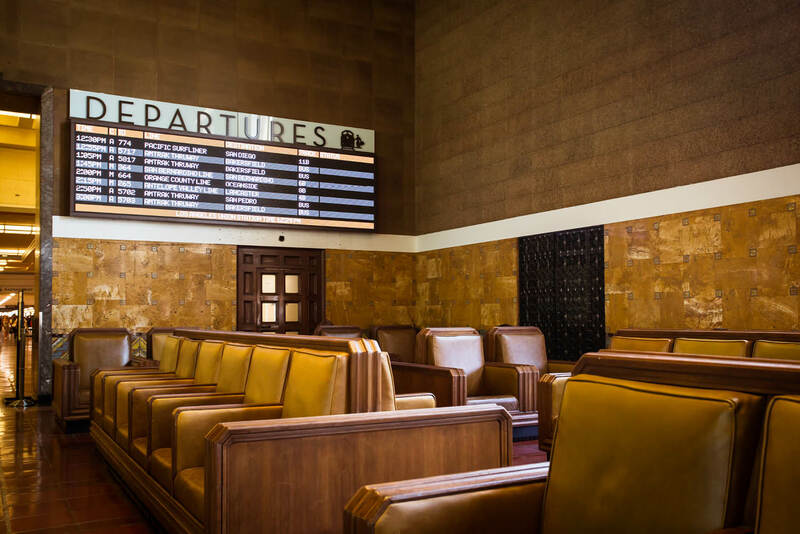 To see modern America’s foibles play out in one of North America’s last great (and immaculately preserved) train stations is the very definition of surreal. Great? 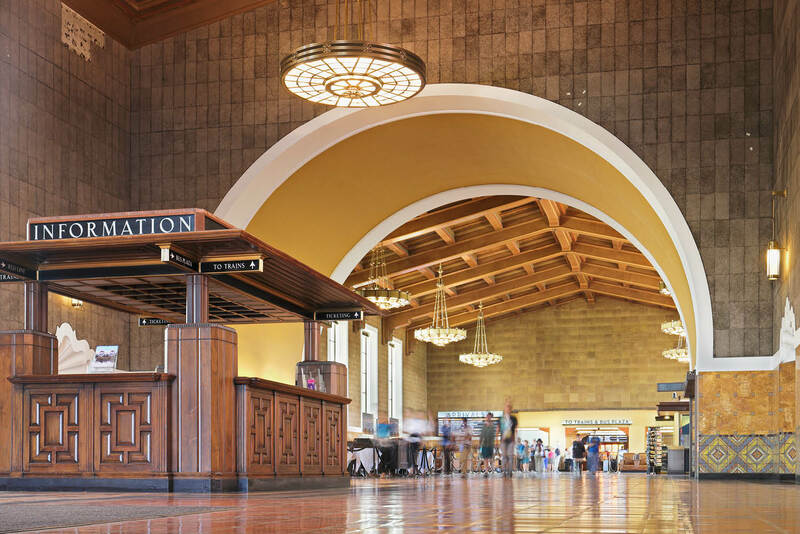 Yes, pristine Union Station, LA’s railway hub since 1939, is an adjective magnet: it’s gorgeous, funky, and filmic – and I could keep going. Its style and presence firmly plants you back in a (real or imagined) grand era. You expect Bogart and Bacall to interact across the quixotic concourse at any second. 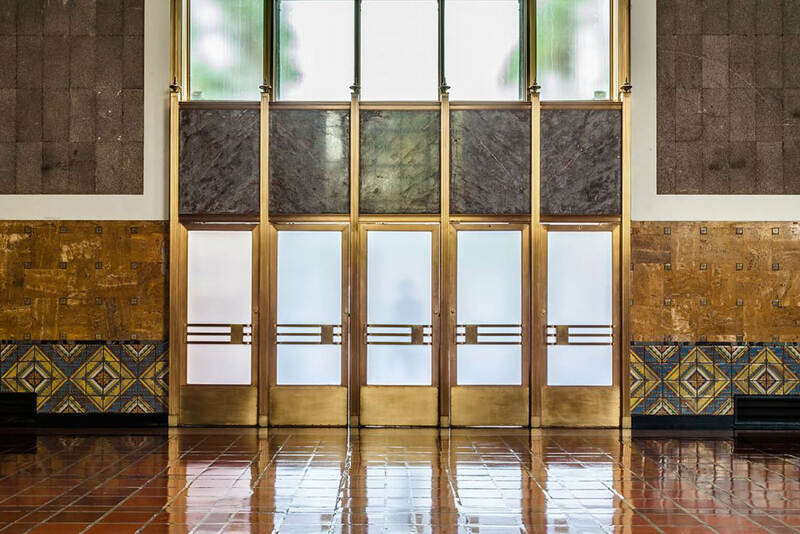 The architecture and fittings seem familiar because they borrow from the highlight reels of several genres: an utterly agreeable mash-up of Art Deco, Spanish Colonial and Mission Revival; unified under ‘Mission Moderne’. This striking public space feels refined, robust and immune from here-today-gone-this-afternoon styles. The colossal Art Deco chandeliers, inlaid marble floors and hand-painted tiles would never get past the accountants these days. The glorious 33-metre-long American black walnut ticket counter sits idle, only useful as a mood-setter and film set these days. Union’s aura makes it a ready-made gateway into history, and it has back-dropped plenty of films, from Blade Runner to Garfield: The Movie. It even had a gaming cameo in Grand Theft Auto: San Andreas, back in the day. Out front, palm trees lined up like troops prelude the compelling 30-metre-high whitewashed clock tower, which shouts West Coast as it used to be shouted. Sadly, perhaps the station’s most iconic element, its original Harvey House restaurant, one of the last in existence, just sits around collecting dust, save for the odd distinctly un-public cultural event. Grainy images of anxious GIs chowing down here as they wait for their troop train are easy to conjure. The station was a bustling 24-hour, seven-day-a-week operation each and every day of the Second World War. Traxx restaurant still claims to purvey ‘elegant New American cuisine served in a unique setting reminiscent of the glamour of train travel’s golden era’. It’s closed today, for some reason or other. Anyway, the bulk of today’s to-ers and fro-ers choose to pit-stop at the Starbucks and Subway, which stain Union’s bygone vibe, even with their low-key signs and attempt-to-blend-in wooden façades. Nearby, ‘Step Up & Show Us What You’ve Got,’ dares a sign in front of a mint-condition dark wood upright piano tucked away just out of the foot traffic. ‘All players welcome’. And step up they do, one after the other, each armed with their go-to tune; businesswomen, schoolboys and retired day-trippers, who probably warm the seat quite often. A tattooed dude wearing flame-covered board shorts and with a cigarette behind his ear caresses out Beethoven’s Für Elise; then Jar of Hearts by Christina Perri. He finishes with a deeply personal, slow-burn version of Billie Jean, and then calmly strolls back into anonymity. The blue-aproned shoe shine guy stares into the middle-distance, as if one of the commuters will bring life to his daydreams. His four wooden booths (in the same style as the waiting room seats, except raised) and shiny brass stirrups aren’t seeing much action today; despite his seven-buck special. Meanwhile, thousands of pairs of un-shineable synthetic shoes shuffle on by. 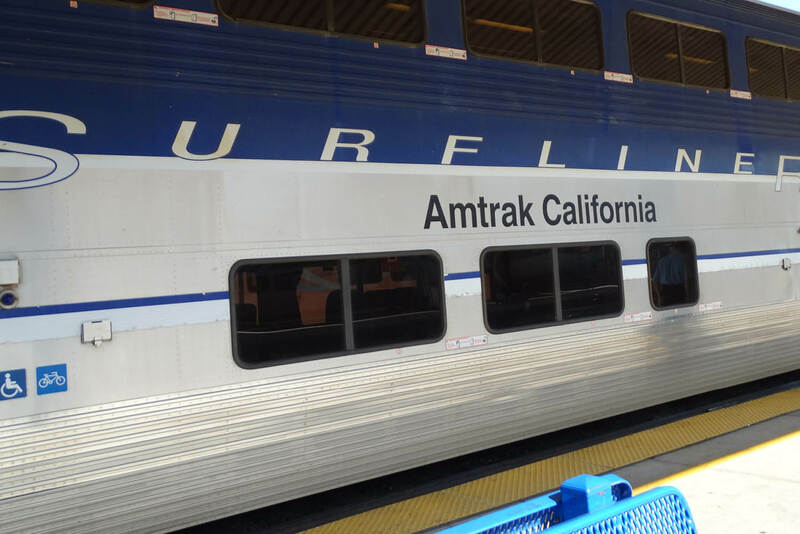 Sadly, it’s time to for me to board the Amtrak Surfliner, the coast-hugging slow train to Santa Barbara, for the next adventure. A conductor with five pens in his leather pocket-protector takes his time to allocate my seat; as if there aren’t 25 people in line staring holes through him. He pencils in my seat number on a master sheet, scratches his sparse scalp, and hands over a pastel coloured ticket. It’s not so much ‘retro’ as ‘haven’t caught up yet’, but the interaction is a breath of fresh air compared with a pitched battle against a foreign electronic ticket machine. Emerging from the long corridor onto a thin, grubby platform changes the vibe and era instantly. The double-decker train and the peeling girders of the covered station roof block out LA’s rays. My coach window-seat is decorated in the style of an early 1990s office: corporate blue and grey upholstery with a freestyle of a few slightly contrasting similar shades. The recliners are Sunday-on-the-lounge comfortable with about a decade of leg room. Despite the TV-screen-like windows, it’s an air-conned bubble that divorces you from LA’s smoggy reality. The polar opposite of the waiting room, which needs you to be part of its storyline. I sit next to people who wear white sneakers and jeans, and introduce themselves by name, age, city and they always throw in the state, too, even if it’s as obvious as the nose on a small person’s face. Who knew Los Angeles was in California? People chat without warning, introduction or expectation; just for chat’s sake. Like they used to before North America got in their cars and drove straight into a traffic jam on a six-lane ‘free’way. LA’s super-sprawl gradually gives way to the less encumbered Cali coast, but all I can think of is those beautiful old seats in that grand waiting hall. A once-great public space that, sadly, doesn’t feel so public anymore. Roped off; not rich from poor, but working class from homeless, destitute and forgotten. Train travel gives you time to ponder such things. Things like, was Union Station like this in the Golden Age of Rail? If not, then, seriously, what happened, America? Perhaps it’s time to get out of your car and that traffic jam and jump back on the train. And chat with whoever you sit next to in that grand waiting room or on that slow train to somewhere. Maybe it’s too early to blame this one on Trump, but I think it’s time modern ‘Merica borrows a few more classic elements like this from the America of Roosevelt.